Fat rolls and flabby skin on the abdomen can cause a decline in confidence levels, especially when you have a swimsuit-bearing occasion coming up. To make matters worse, research has shown that people who carry their extra weight around their waist have the highest risk of all of heart attacks, strokes and other problems that arise from clogged, hardened arteries according to the University of Michigan. Lose the rolls, improve your health and flatten your belly by making the right lifestyle adjustments. Become more strict with your eating habits. Avoid buffet lines, all-you-can-eat nights and foods that are loaded with fat and calories. Stick with foods that have high nutrient content like lean meats, fresh fruits and vegetables, whole grains, beans and low-fat dairy products. Exchange all the high-calorie beverages in your diet with water. Not only is water calorie-free, but it also hydrates your body. Drink it with your meals as well to help fill up your stomach. Include cardiovascular exercise into your weekly routine. The American College of Sports Medicine recommends 60 to 90 minutes of cardio for weight loss. Perform any type of cardio for this time frame that will get your heart rate elevated, such as indoor cycling, elliptical training, running, kickboxing, dance aerobics or swimming. Work out three days a week on nonconsecutive days. Lift weights to pack on metabolically active muscle mass. 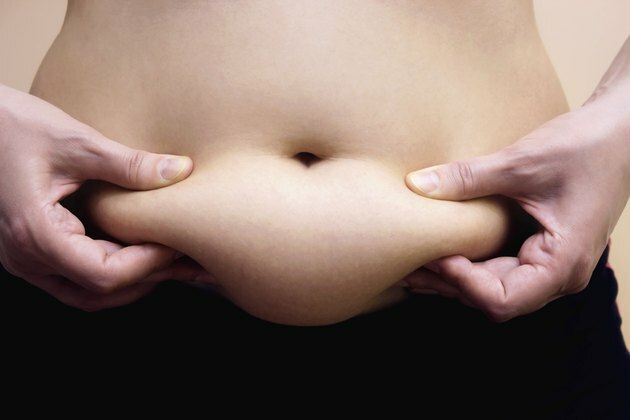 Muscle burns a high amount of calories while you are sitting still which leads to faster weight loss in your abdomen. Do exercises like chest presses, shoulder presses, deadlifts, dips and squats. All of these exercises work your major muscles and force you to contract your abs. Aim for eight to 12 reps, do three to five sets and work out three days a week on noncardio days. Perform dedicated ab exercises with added resistance. For example, perform stability ball crunches while holding a weight plate straight above your chest. Follow this same pattern with leg raises, reverse decline crunches, Russian twists and bicycle crunches. Strap ankle weights to your lower legs to increase the resistance with the leg raising exercises. Aim for 12 to 15 reps, do three or four sets and work your abs three days a week after your cardio sessions. Sit on a stability ball at work. Mix in ab exercises during the day like crunches, planks and seated circles. Find other ways to incorporate more exercise into your day as well, such as tapping your feet, standing on one foot while talking on the phone and using the bathroom on the floor above you. Deploy better sleeping habits into your life. Failure to get a full night's sleep can lead to weight gain or compromise the beneficial effects of a reduced calorie diet on total body fat, according to the Reuter's website. Aim for at least seven hours of sleep a night to prevent this from happening. When you are sleep deprived, your body's hunger control hormones become out of balance and you tend to overeat during the day.